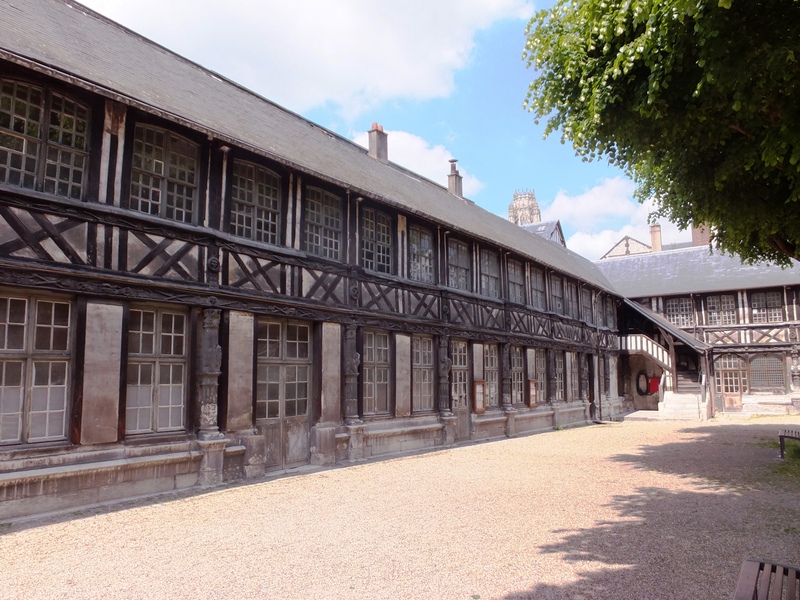 In 1348 Rouen was struck by the Black Plague epidemic. The results were horrific. Somewhere between 50%-70% of the inhabitants perished. Death came so rapidly that there was not time enough to bury the victims in separate graves with tombstones. So a new burial ground, a plague pit, was opened near the Church of St. Maclou. Corpses of the rich and poor were indiscriminately buried in the pit. 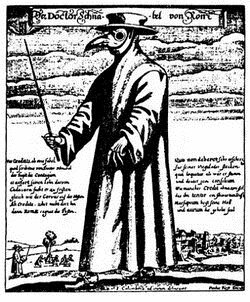 The Plague’s death rate peaked in the spring and summer and then vanished as rapidly as it came. At that time Christian teaching ruled that to achieve resurrection and the final judgment the deceased’s body needed to be intact in the grave. As a result the plague pit remained in place. Over the years half-timbered structures were built around a square enclosing the burial area. In the 16th century the scourge once again devastated Rouen. This time the death toll totaled approximately 66% of the population. 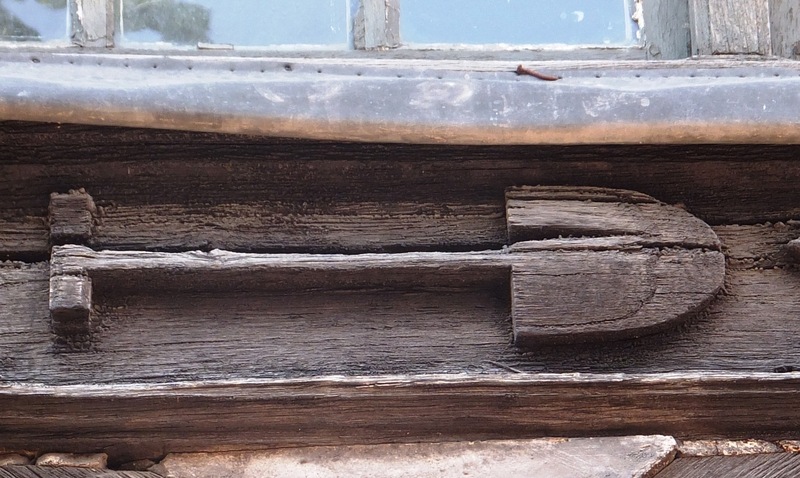 City fathers decided to disinter victims of the previous epidemic in 1526. 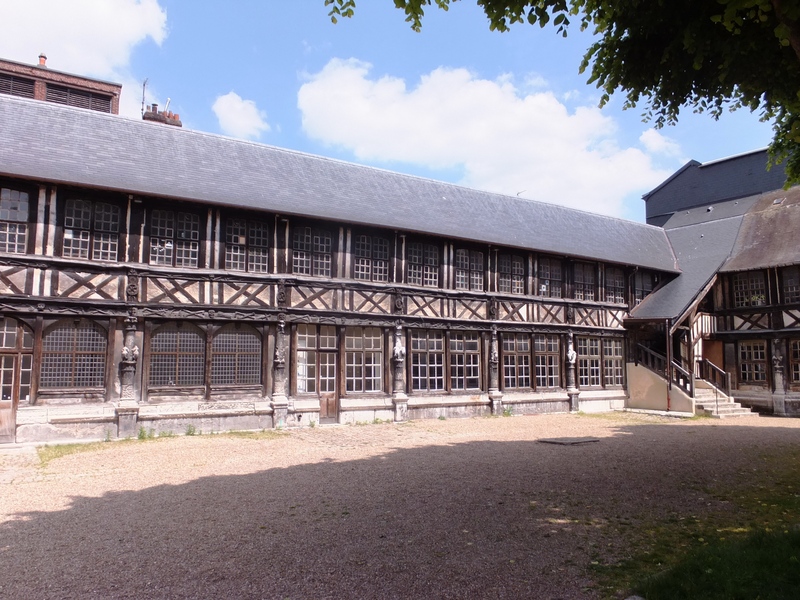 They constructed a four gallery half-timbered wooden ossuary around the old plague pit to be used for saving the intact bones of the previous deceased as required by Christian canon. Then this next tranche of corpses were buried where the dead of the 14th century had rested for two centuries. The gallery was completed in 1533. 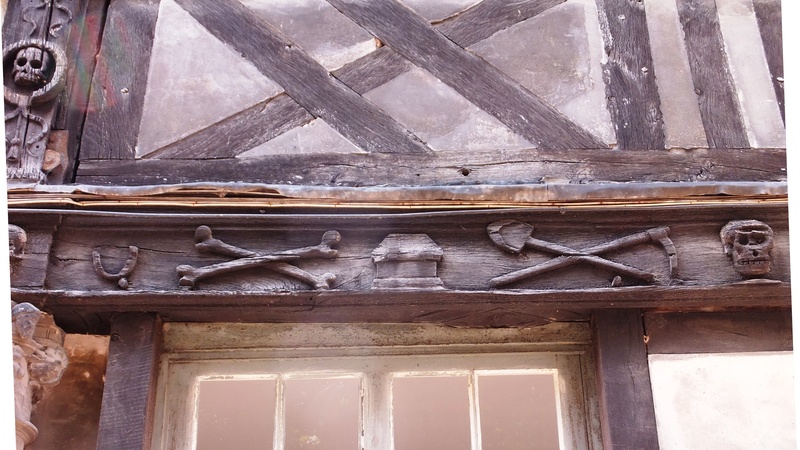 Craftsmen decorated the wooden beams of the structure with symbolic carvings of skulls, bones, gravediggers, spades, picks, coffins and mattocks ( a tool used in digging). 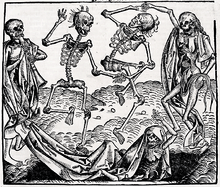 There is even a danse macabre carving. Burials ceased in 1781. Aitre St-Maclou was declared a historical site in 1862.